Are you iodine deficient?… An estimated 1.9 billion people worldwide have inadequate iodine intake. If you live in the GTA, Toronto, Niagara, Burlington, Hamilton, or Buffalo and you would like to assess iodine and associated thyroid issues, our advanced clinical nutrition protocol is ideal. Iodine/iodide has been used safely and effectively by 3 generations of doctors since 1816 in a 12.5-50.0 mg per day dosage range. In 1824, Jean Baptiste Boussingault observed that inhabitants near silver mining sites had a relatively low occurrence of goiter. 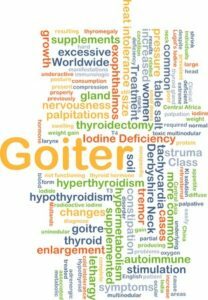 [Goiter is an enlarged thyroid gland present in some hypo or hyper thyroid states.] Inhabitants nearby daily consumed locally sourced salt high in iodide; the same salt used in the extraction of silver. He recommended iodized salt to fight goiter. Thyroid nodules (benign or malignant) are low in iodine. Iodine therapy can reduce and eliminate nodules; iodine therapy can be effective in either scenario. The RDA of iodine set at 150-290ug/day is quite insufficient to help low thyroid metabolism. Only 15% of prenatal vitamins have a >150ug daily dose (“a public health disaster” – Dr David Brownstein). Over past 40 years, iodine content in the US population has declined by ~50%. Over this timespan thyroid illness (all types – autoimmune, hypo, cancer) and cancer of breast/prostate/ovary/endometrium/pancreas (all associated with iodine deficiency) have increased significantly. More than 40% of childbearing aged women have urinary iodine levels below 100ug/L. 70% of girls aged 14-15 in the UK have urinary iodine levels below 100ug/L. 36% of school-aged children worldwide are iodine deficient (according to WHO). 33% of the populated world is considered an iodine deficient area. Although useful as a monitoring tool, standard thyroid testing is insufficient to diagnose all thyroid compromised conditions unless they are of classic hypo or hyper profile. Reference ranges recommended by the American Association of Clinical Endocrinologists show greater need to consider thyroid problems at lower TSH levels. The chief use of iodine is to help in cases of hypothyroid or sluggish thyroid (other low thyroid labels for this type of condition include subclinical hypothyroidism, Wilson’s temperature syndrome, or euthyroid sick syndrome). Iodine is a building block of all thyroid hormones. Iodine is also necessary for the production of other body hormones including those produced by ovaries, adrenals, and testicles, etcetera. Iodine is responsible for architecture glandular tissue of the breast, ovary, and thyroid. Iodine can also be helpful in autoimmune thyroid conditions including Hashimoto’s or Grave’s disease. Iodine helps the body fight against immune attacks by improving granulocyte movement to inflammatory sites and their ability to kill bacteria. Iodine is helpful for neurodevelopment. Iodine intake in hypothyroid Mom’s is optimal if started early in gestation. Delaying iodine supplementation is associated with offspring with neurodevelopment delay. Iodine is an alkalinizing mineral which is important if you are acidic or have conditions that thrive in acidic environments (kidney stones, arthritis, cancer, etcetera). Common symptoms of iodine deficiency include goiter and classic hypothyroid symptoms including fatigue, brain fog, constipation, and cold extremities. Several excerpts herein are referenced from lectures by Dr David Brownstein. The BodyMindLink series by Dr Ray Pataracchia ND provides insight on Naturopathic approaches that matter and have the potential to benefit general and mental health. Clinical approaches discussed are implemented by the Naturopathic Medical Research Clinic (NMRC) in Toronto, Ontario. This clinic treats a wide array of health conditions. Disclaimer: Information provided is not to be used for self-assessment, diagnosis or treatment. We advise readers to discuss these topics with their health care provider or book an appointment with our Toronto clinic.